The third book in the “Fall Revolution” series is a sequel to “The Stone Canal”. It is set several centuries after the end of the Earth-based plot thread in “The Stone Canal”, the super-intelligent Fast Folk have gone but the remnants they left behind have bombarded the Earth with computer viruses, leading to a collapse in the Internet and computer technology. The future society has changed drastically, into an extreme form of anarchist socialism where every major resource is free and there is no governmental control (somewhat reminiscent of The Culture in Iain M. Banks’ Science Fiction series). 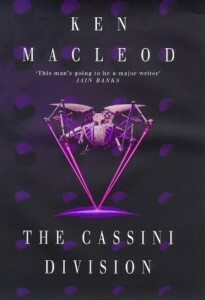 The main character is Ellen May Ngwethu, a member of the titular Cassini Division, a military organisation that guards the New Mars wormhole and protects humanity from any resurgence of the Fast Folk, believing that a re-emergence of the AIs could lead to a disaster for humanity. After the first visitor from New Mars in centuries comes through the wormhole, Ellen must go on a journey to one of the Solar System's few remaining capitalist enclaves to consult Professor Malley, the man who invented the mathematics behind the wormhole's operation. This book is simpler than any of the other Fall Revolution books, with a linear (apart from some flashbacks) narrative all told from the viewpoint of Ellen. She is an interesting character, with a philosophy that seems quite alien but is also quite believable. She is also extremely ruthless in pursuit of her goals and one of the more interesting points of the book is whether her mission is morally right or not. As usual, Macleod refuses to explicitly pass judgement on her actions either way. Again, there are plenty of ideas – particularly on the potential benefits and dangers of artificial intelligence and on the question of how much is justified in the name of self-defence. There is also some complicated physics which manages to sound reasonably plausible (even though I suspect it isn't). The future society also seems reasonably plausible at first glance, despite being drastically different to any contemporary society, although again I suspect it wouldn't work in practise nearly as well as in the book, with the author choosing to make the future world a virtual utopia which seems slightly simplistic. In summary, this is an entertaining book that is an easier read than some of MacLeod's other work. Despite the simpler prose, it still has plenty of depth and ideas.